This article is about the genus of mainly extinct trees. For its single extant species, the ginkgo tree, see Ginkgo biloba. Ginkgo is a genus of highly unusual non-flowering plants. The scientific name is also used as the English name. 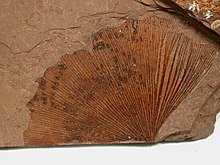 The order to which it belongs, Ginkgoales, first appeared in the Permian, 270 million years ago, possibly derived from “seed ferns” of the order Peltaspermales, and now only contains this single genus and species. The rate of evolution within the genus has been slow, and almost all its species had become extinct by the end of the Pliocene; the exception is the sole living species, Ginkgo biloba, which is only found in the wild in China, but is cultivated across the world. The relationships between ginkgos and other groups of plants are not fully resolved. The ginkgo (Ginkgoales) is a living fossil, with fossils similar to modern ginkgo from the Permian, dating back 270 million years. The most plausible ancestral group for the order Ginkgoales is the Pteridospermatophyta, also known as the “seed ferns“, specifically the order Peltaspermales. The closest living relatives of the clade are the cycads, which share with the extant G. biloba the characteristic of motile sperm. 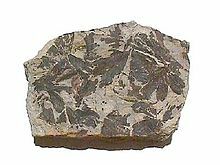 Fossils attributable to the genus Ginkgo first appeared in the Early Jurassic, and the genus diversified and spread throughout Laurasia during the middle Jurassic and Early Cretaceous. It declined in diversity as the Cretaceous progressed with the extinction of species such as Ginkgo huolinhensis, and by the Palaeocene, only a few Ginkgo species, Ginkgo cranei and Ginkgo adiantoides, remained in the Northern Hemisphere, while a markedly different (and poorly documented) form persisted in the Southern Hemisphere. At the end of the Pliocene, Ginkgo fossils disappeared from the fossil record everywhere except in a small area of central China, where the modern species survived. It is doubtful whether the Northern Hemisphere fossil species of Ginkgo can be reliably distinguished. Given the slow pace of evolution and morphological similarity between members of the genus, there may have been only one or two species existing in the Northern Hemisphere through the entirety of the Cenozoic: present-day G. biloba (including G. adiantoides) and G. gardneri from the Palaeocene of Scotland. At least morphologically, G. gardneri and the Southern Hemisphere species are the only known post-Jurassic taxa that can be unequivocally recognised. The remainder may have been ecotypes or subspecies. The implications would be that G. biloba had occurred over an extremely wide range, had remarkable genetic flexibility and, though evolving genetically, never showed much speciation. While it may seem improbable that a species may exist as a contiguous entity for many millions of years, many of the ginkgo’s life-history parameters fit. These are: extreme longevity; slow reproduction rate; (in Cenozoic and later times) a wide, apparently contiguous, but steadily contracting distribution coupled with, as far as can be demonstrated from the fossil record, extreme ecological conservatism (restriction to disturbed streamside environments). Modern-day G. biloba grows best in well-watered and drained environments, and the extremely similar fossil Ginkgo favoured similar environments; the sediment records at the majority of fossil Ginkgo localities indicate it grew primarily in disturbed environments along streams and levees. Ginkgo therefore presents an “ecological paradox” because, while it possesses some favourable traits for living in disturbed environments (clonal reproduction), many of its other life-history traits (slow growth, large seed size, late reproductive maturity) are the opposite of those exhibited by modern plants that thrive in disturbed settings. Given the slow rate of evolution of the genus, it is possible that Ginkgo represents a pre-angiosperm strategy for survival in disturbed streamside environments. Ginkgo evolved in an era before flowering plants, when ferns, cycads, and cycadeoids dominated disturbed streamside environments, forming a low, open, shrubby canopy. The large seeds of Ginkgo and its habit of “bolting”—growing to a height of 10 metres (33 ft) before elongating its side branches—may be adaptations to such an environment. Diversity in the genus Ginkgo dropped through the Cretaceous (along with that of ferns, cycads, and cycadeoids) at the same time the flowering plants were on the rise, which supports the notion that flowering plants, with their better adaptations to disturbance, displaced Ginkgo and its associates over time. Ginkgo has been used for classifying plants with leaves that have more than four veins per segment, while Baiera for those with less than four veins per segment. Sphenobaiera has been used to classify plants with broadly wedge-shaped leaves that lacks distinct leaf stems. Trichopitys is distinguished by having multiple-forked leaves with cylindrical (not flattened), thread-like ultimate divisions; it is one of the earliest fossils ascribed to the Ginkgophyta. As of February 2013[update], molecular phylogenetic studies have produced at least six different placements of Ginkgo relative to cycads, conifers, gnetophytes and angiosperms. The two most common are that Ginkgo is a sister to a clade composed of conifers and gnetophytes or that Ginkgo and cycads form a clade within the gymnosperms. A 2013 study examined the reasons for the discrepant results, and concluded that the best support was for the monophyly of Ginkgo and cycads. ^ Taylor & Taylor (1993), pp. 138, 197. ^ R. Govaerts. “Ginkgo L., Mant. Pl. 2: 313 (1771)”. World Checklist of Selected Plant Families. Royal Botanic Gardens, Kew. Retrieved June 8, 2013. ^ “Genus: Ginkgo L.” Germplasm Resources Information Network. United States Department of Agriculture. Retrieved June 8, 2013. ^ Royer et al. (2003), p. 84. ^ Royer et al. (2003), p. 85. ^ a b Royer et al. (2003), p. 91. ^ Royer et al. (2003), p. 87. ^ Royer et al. (2003), p. 92. ^ Royer et al. (2003), p. 93. Dana L. Royer, Leo J. Hickey & Scott L. Wing (2003). “Ecological conservatism in the “living fossil” Ginkgo“. Paleobiology. 29 (1): 84–104. doi:10.1666/0094-8373(2003)029<0084:ECITLF>2.0.CO;2. Thomas N. Taylor & Edith L. Taylor (1993). The Biology and Evolution of Fossil Plants. Englewood Cliffs, NJ: Prentice Hall. ISBN 0-13-651589-4. Chung-Shien Wu, Shu-Miaw Chaw & Ya-Yi Huang (2013). “Chloroplast phylogenomics indicates that Ginkgo biloba is sister to cycads”. Genome Biology and Evolution. 5 (1): 243–254. doi:10.1093/gbe/evt001. PMID 23315384.